Up to World War II, the prevalent view was that the substance and scope of human rights was an internal matter for national governments. 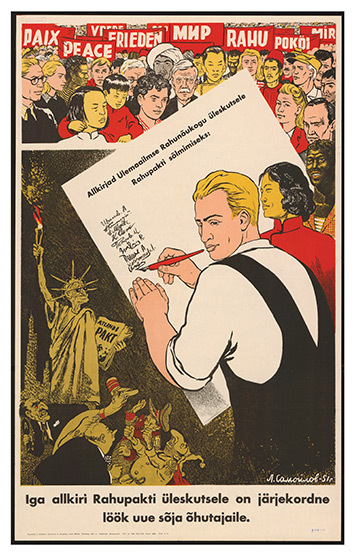 The excesses of the totalitarian regimes in Nazi Germany and the Communist Soviet Union – where people were persecuted on racial, ethnic and political grounds – forced a reassessment of this notion. 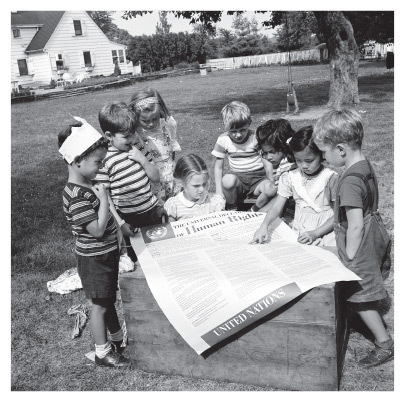 On 10 December 1948, the UN General Assembly adopted the Universal Declaration of Human Rights. The Soviet Union and its satellite states did not vote in favour, as nearly all human rights were violated in these countries. PRESS CONFERENCE OF THE UNIVERSAL DECLARATION WORKING GROUP. E. ROOSEVELT AND C. MALIK. THE UNIVERSAL DECLARATION ON HUMAN RIGHTS, ADOPTED BY UN GENERAL ASSEMBLY RESOLUTION 217 A III, ON 10 DECEMBER 1948. 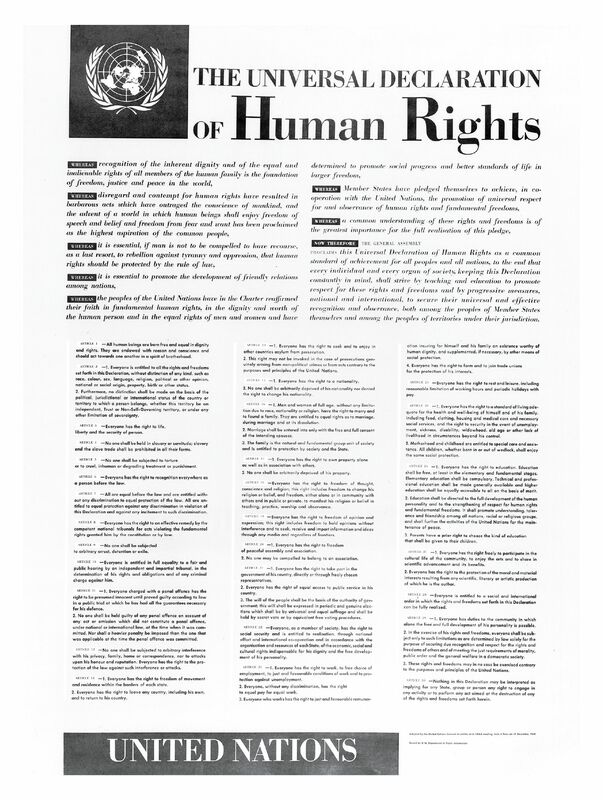 HUMAN RIGHTS ARE THE BIRTHRIGHTS OF EVERY INDIVIDUAL AND ARE INDEPENDENT OF THEIR ORIGIN, GENDER, AGE, RACE, ETHNICITY, LANGUAGE, RELIGIOUS CONFESSION, CONVICTIONS, ORIENTATION AND OTHER CIRCUMSTANCES. HUMAN RIGHTS ARE UNIVERSAL, INALIENABLE AND ARE PART OF HUMAN DIGNITY INDEPENDENT OF NATIONAL SOVREIGNITY OR VALID LAW. The General Assembly does not have the power to enact binding legislation, and the Universal Declaration is thus not legally binding, either. Still, countries are expected to comply as human rights are listed in the document as goals. 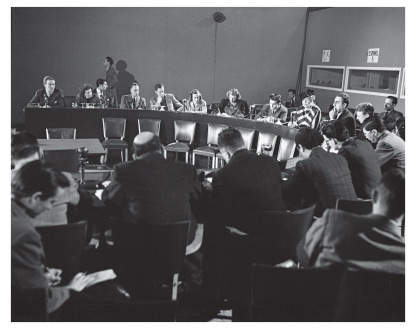 In 1950, the Council of Europe adopted the European Convention on the Protection of Human Rights and Fundamental Freedoms. The Soviet Union was hostile toward the Council of Europe, as it stood up for human rights. Estonia, like other democratic countries, respects human rights and has established legal mechanisms for safeguarding human rights. Article 2 of the Estonian Constitution sets forth people’s fundamental rights, liberties and obligations. HUMAN RIGHTS DAY WAS ALSO FOR THESE PEOPLE. 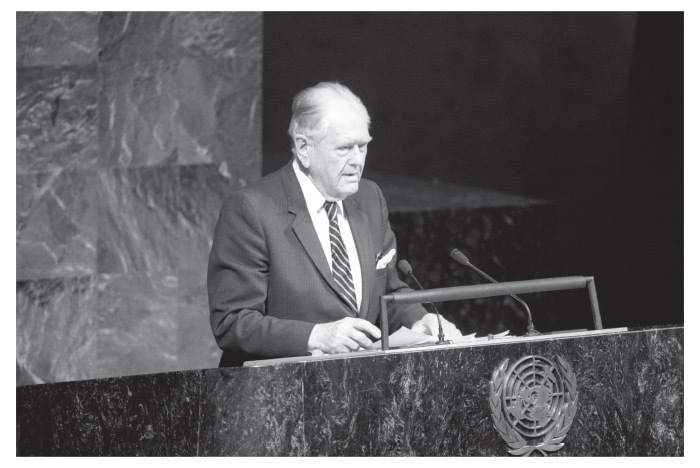 ESTONIA’S FIRST PERMANENT REPRESENTATIVE AT THE UN WAS ERNST JAAKSON, ESTONIA’S CONSUL-GENERAL FOR MANY YEARS AND SYMBOL OF THE CONTINUITY OF THE REPUBLIC OF ESTONIA AT THE UNITED NATIONS DURING THE SOVIET OCCUPATION. The Soviet occupation of Estonia, which started in 1940 and was interrupted by a German occupation from 1941 to 1944, lasted until September 1991. Massive violations of human rights occurred during this period. 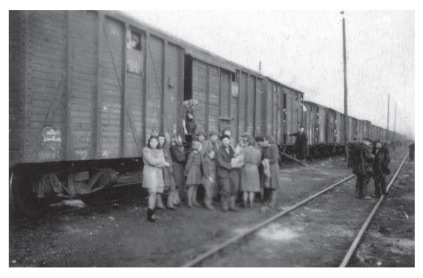 Not long after the Universal Declaration of Human Rights was adopted, the Soviet Union carried out a mass deportation in Estonia on 25 March 1949. Over 20,000 people were forcibly relocated to Siberia – predominantly women, children and the elderly. 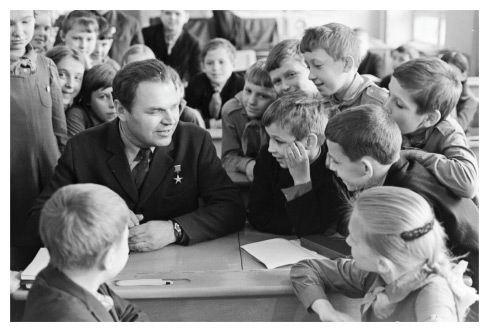 All the while, people from elsewhere in the Soviet Union resettled in Estonia, and the Estonian percentage of the population dropped from 98% to 61% in the years from 1945 to 1989.
preferring the use of Russian in conducting official business. A HERO OF SOCIALIST LABOUR, IDENTIFIED AS L. KRONK, MEETING PIONEERS AT THE OLD PLANT AT KREENHOLM TEXTILE MILL IN THE CITY OF NARVA. APRIL 1973. 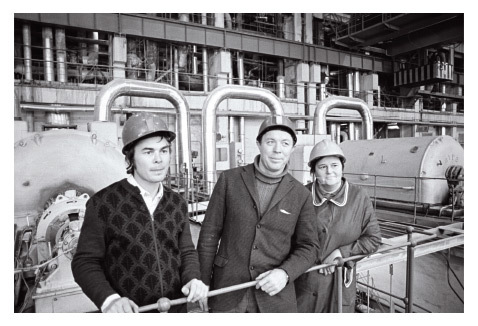 (FROM RIGHT) BALTIC THERMAL POWER PLANT MACHINIST A. IVANOVA, HONOURED WITH A ORDER OF RED FLAG OF LABOUR AND THE ORDER “BADGE OF HONOUR”, KASYANENKO AND P. MANAJEV. DECEMBER 1978. TRAIN CAR NO. 45 WITH DEPORTEES FROM VÕRU, VALGA, TARTU AND PÄRNU BOUND FOR THE OTHER SIDE OF THE URALS. APRIL 1949. 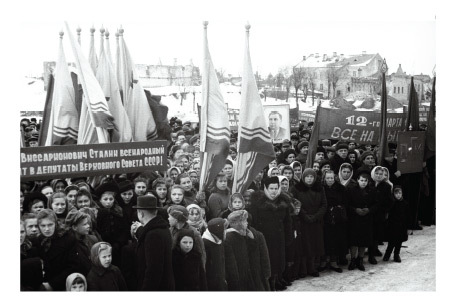 CITY-WIDE MEETING OF THE SUPREME SOVIET OF THE USSR IN NARVA PRIOR TO ELECTIONS. MARCH 1950. The Soviet occupation led to nationalization of private enterprise and private property, the collectivization of agriculture, militarization (as many as 150,000 occupation soldiers were stationed in Estonia), border zones and closed cities where ordinary citizens were not allowed to go. In Narva, Sillamäe, Paldiski and Kohtla-Järve, the ethnic composition of the population was altered deliberately. 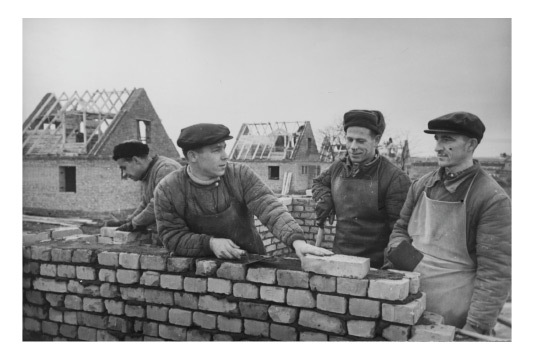 Immigrants from other parts of the Soviet Union were predominantly hired in key positions, as it was feared that Estonians might put up resistance. Estonia lost about 25% of its population due to crimes against humanity, one of the highest figures in Europe. As a result of the Soviet Union’s colonization policy, Estonians faced the prospect of becoming a minority in their own homeland. FUTURE PUPILS AT THE NEW SCHOOL IN LASNAMÄE. AUGUST 1979. GROUP OF WORKERS IN KREENHOLM TEXTILE MILL (FROM LEFT): THE ASSISTANTS TO THE MASTER SPECIALIST IN THE OLD MILL, IDENTIFIED ONLY AS V. TIMOFEEV, P. PYKHHTEYEV AND NARVA CONSTRUCTION TRUST WORKER V. GONCHAR BUILDING RESIDENTIAL BUILDINGS. NOVEMBER 1957. The Soviet regime was intolerant toward dissidents as they were seen as a threat to the monopoly on power. The Soviet Union was a classic totalitarian state. 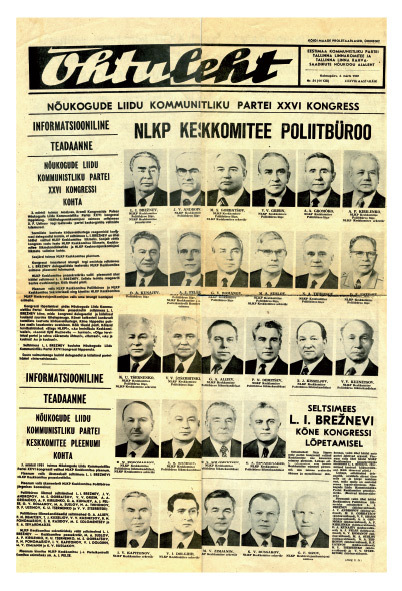 Power was concentrated in the hands of a limited ruling cadre, installed by the leadership of the Communist Party – the Politburo of the Central Committee of the Communist Party of the Soviet Union (CPSU). A repressive apparatus made up of secret police (GPU, NKVD, KGB), the militsiya (civilian police), and the military ensured the grip on power. Power resided in a closed circle and regime change could only be the result of a conspiracy or coup. The Soviet Union and other communist countries violated human rights and tried to supplant them with social guarantees. Yet they did not succeed in offering the latter, either. 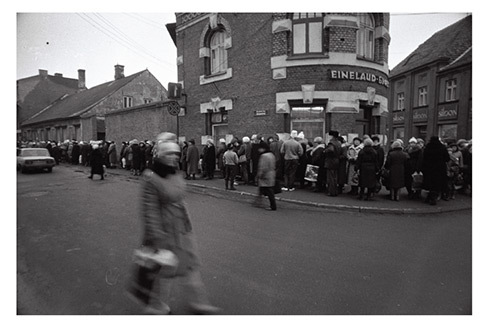 LINE FOR COFFEE BEANS ON HOMMIKU STREET IN PÄRNU. FEBRUARY 1988. 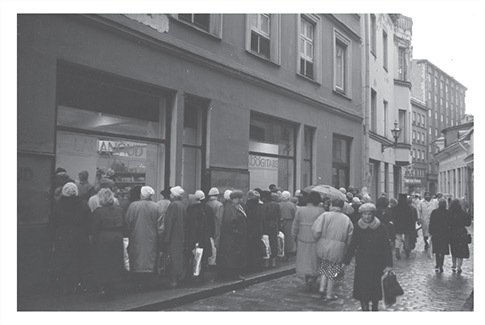 LINE FOR A BUTCHER’S SHOP ON VÄIKE-KARJA STREET IN TALLINN. TALLINN. 28 DECEMBER 1990. People who called for human rights were sent to prison for years. The Soviet Union has now crumbled and the communist dictatorship in the former Soviet republics is no more. Yet there are still countries where Soviet-type totalitarianism clings on and human rights are still being violated. North Korea, Cuba and China are examples. Extensive human rights violations also take place in countries that do not consider themselves communist – Burma, Syria and some countries in Africa. 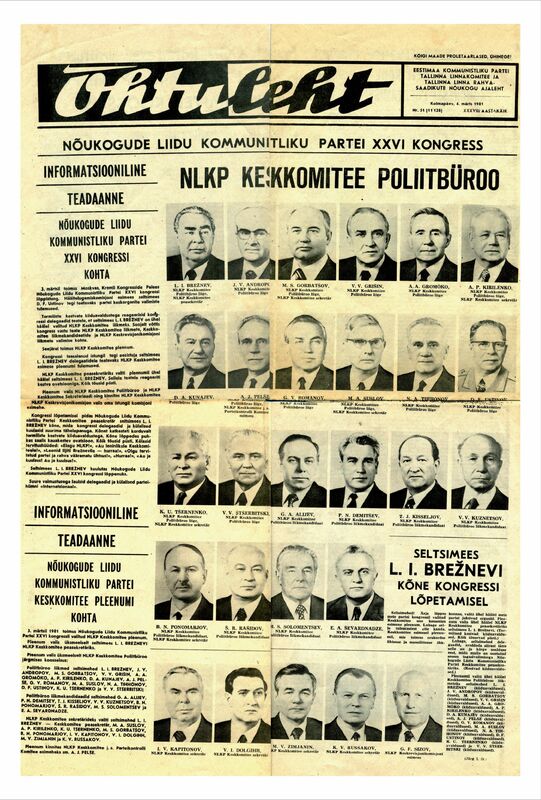 NEWSPAPER OF THE ESTONIAN COMMUNIST PARTY’S TALLINN COMMITTEE AND THE OF THE CITY OF TALLINN’S COUNCIL OF PEOPLE’S DEPUTIES. 4 MARCH 1981. 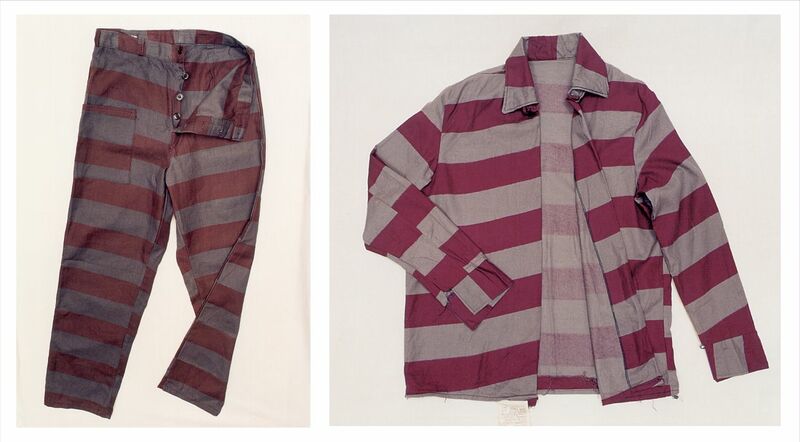 PRISONER’S UNIFORM IN A SPECIAL-SECURITY-REGIMEN INSTITUTION, A PRISONER’S DAY SHIRT WITH PURPLE AND GREY STRIPES; MADE IN A PRISON, OMSK 1981. EVEN BASIC HUMAN WANTS AND NEEDS WERE SUBJUGATED TO SOVIET PROPAGANDA, WHILE DEPICTING IDEOLOGICAL OPPONENTS AS HATERS OF HUMANKIND AND WARMONGERS. 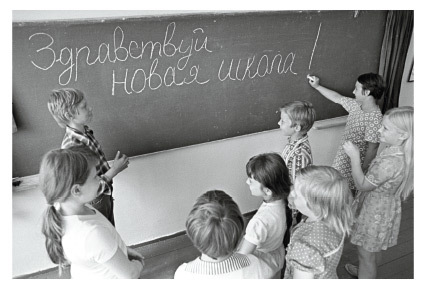 PHOTO CREDIT L. SAMOILOV, 1953.